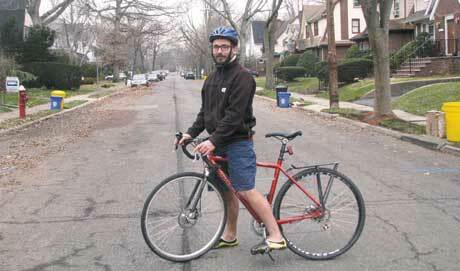 Cyclist Dov Neimand enjoyed a nice date in Brooklyn but had a scary ride back to his home in Teaneck. I try to walk, kayak, or bike as often as possible. That’s part of my effort to save the planet, stay in good health, and get the most out of my time here. So when I arranged to meet a pretty lady for a date in Brooklyn, there was never any doubt about how I would get there. I biked from my Teaneck home to work in the Heights, and after a long day I headed south to Brooklyn. At 11 p.m. I pedaled up through Brooklyn on Flatbush Avenue and thought back on my evening. Over the Manhattan Bridge bike path, across town, and up the Hudson River Greenway, I rode through the night on a dark and empty bike path. The Hudson resonated with Manhattan’s nightlife. It reflected towering skyscraper lights and pulsed against the rocks with water so black that a sleepy cyclist could lose himself in it. I was almost home. The George Washington Bridge and 30 minutes of Jersey streets were all that separated me from a shower and bed. A locked gate barred my path across the bridge. With a little bit of hunting I found the north side walkway. I turned onto the street and up the ramp to the bridge lanes with light, 1-in-the-morning traffic. Orange cones and signs with bright lights closed all but one of the lanes for construction. A truck was behind me, moving at my snail’s pace, without enough room to pass. I pulled over to the side, dismounted, and lifted my bike over the railing onto the north side pedestrian walkway. The north side walkway seemed to be permanently closed. Not for safety reasons, I hoped. I edged away from the drop to the Hudson as best I could and watched for potholes and other obstacles as I proceeded cautiously over the river. Near the other end of the bridge, I found another locked gate. I began to climb back into the traffic. The construction workers in the closed lanes started yelling at me. “Go back the way you came!” joined the chorus. I ignored them. At the next break in traffic, I crossed the lane into the construction area. “What you gonna do now?” one of them asked me. I couldn’t cross back to the other side of the fence on the walkway, because there were three more locked fences ahead. I could pick a direction, head onto a highway in the night, and hope I’d soon find an exit. He was a big man, standing close, screaming “Stay here” again and again. Trucks roared by on the single lane, then spread into the maze of dimly lit highway options. I didn’t want to deal with the police. What if they gave me a ticket. What if they put me in jail? 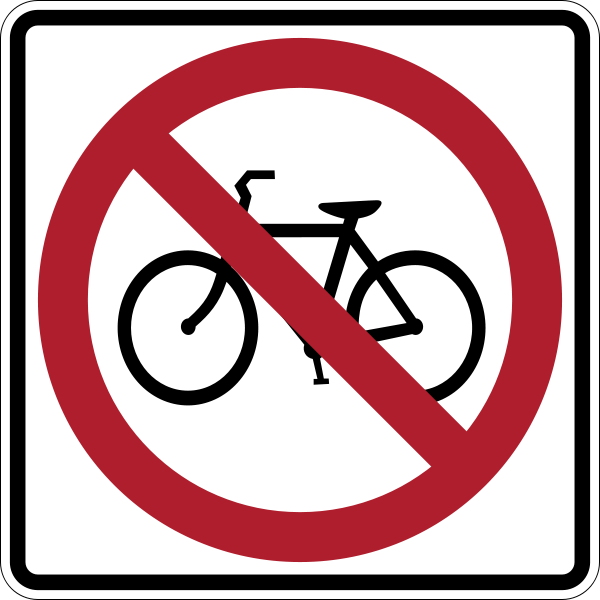 But I also didn’t want to bike into the New Jersey highway system in the night. I decided to wait. The manager yelled at everyone to get back to work. A Port Authority van pulled up. The construction area was full of pickup trucks. They wouldn’t give me a ride, even a few hundred meters off the bridge, because if something happened to me they would be liable. A tall skinny worker was friends with a contractor who could take me and my bike off the bridge for five dollars. I didn’t have any cash. I showed them my open wallet. They would not take me. “No, but thank you for the offer.” I said. “You’re not separating me from my bicycle,” I said. I knew that he was trying to steal my bike. But what if he wasn’t? I wanted to get home. I didn’t want to get in trouble with police for biking on the bridge. I was nervous. I was tired, hungry, and cold. But I wasn’t about to flee the police, even if the con man had tapped into my fear. “No,” I told him, “I’ve never even gotten a ticket. ” I thought about it, that wasn’t true. “Except for once when I got caught not cleaning up after my dog.” I had been 13. I decided to keep my recent incarceration in North Cyprus to myself. He gave me a lift. He didn’t handcuff me like they did in Cyprus . Apparently, I was neither the first nor would I be the last cyclist to try to cross the bridge at night. Three hundred meters, and he dropped me off at an island bus stop in the middle of the highway. I hauled my bike upstairs and walked over a footbridge into Fort Lee. Half an hour later it was 3 in the morning, and my dog was telling me how much she had missed me.